Kearney School District and the Kearney Fire and Police Departments recently conducted a Violence Response Training at KSD as part of the district’s goal to continue to enhance the safety and security of the district. 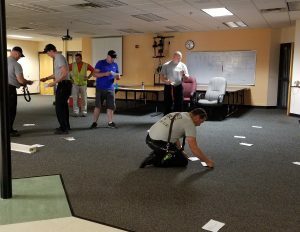 The training, that included emergency responders, school staff and volunteer KSD students from the Junior Police Academy, simulated scenarios to help train responders to act swiftly in the event of a crisis situation at KSD. A training of this nature developed from ideas initiated through a committee organized by the district called the Safety & Security Ad Hoc Committee. As part of the ongoing plan, this was the first of several training sessions that will take place. To learn more about school safety at KSD, visit our School Safety Department page.